With parallel imaging MS/MS, TOF-SIMS peaks can now be identified unambiguously. 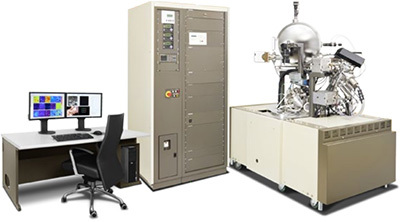 The PHI nanoTOF II is a TOF-SIMS (Time-of-Flight Secondary Ion Mass Spectrometry) instrument for elemental, chemical and molecular imaging, with applications in many fields, including material development and failure analysis. TOF-SIMS uniquely combines sensitivity, spatial resolution and molecular specificity. For more information about how TOF-SIMS works, read our article. The patented TRIFT mass spectrometer from Physical Electronics delivers excellent sensitivity and can image highly topographic surfaces. Depending on your requirements, the PHI nanoTOF TOF-SIMS can be configured with a variety of options to optimise performance for organic materials, inorganic materials, or both. Watch a video interview with Maastricht University, where the first nanoTOF II was installed in December 2015. 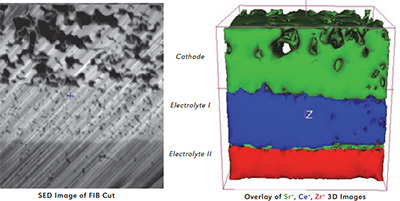 3D FIB-TOF images of a solid oxide fuel cell with a 50 x 50 x 10 µm analysis volume. Observe compositional information and physical structures such as voids. The nanoTOF II is based on PHI’s patented TRIFT mass spectrometer, with three 90° sector electrostatic analysers (ESA). This design eliminates metastable ions, to produce spectra with very low background and excellent detection limits. The TRIFT analyser has a larger angular acceptance, larger energy bandpass and a larger depth-of-field than any other analyser design. with higher beam currents than ever before. Achieve both high spatial resolution or high mass resolution in a single, fast analysis. The new mode is called HR2 imaging. HR² imaging: Images of micro-organic droplets. 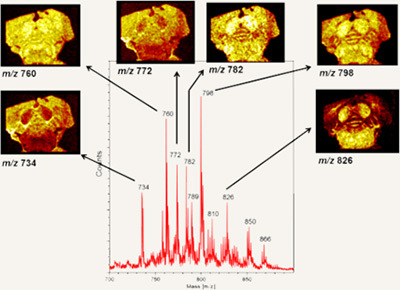 Peaks for multiple molecular fragments in the spectrum at m/z 57 with high mass resolution, identified by their exact mass. The distribution of each species is visualised with a spatial resolution of less than 400 nm. The single measurement containing all this information took only 6 minutes, due to the high ion beam current of the nanoTOF’s HR² imaging mode. Physical Electronics was the first surface analysis manufacturer to offer C60+ and Ar gas cluster ion beam sputtering. The 20 kV C60 ion gun can depth profile most organic and inorganic materials, with high sensitivity for organic spectroscopy. The versatile 20 kV Ar2500+ gas cluster ion beam is ideal for depth profiling organic films. 20 kV Ar2500+ gas cluster ion beam for molecular depth profiling organic films. Depth profile of a multi-layer polystyrene and poly (2-vinylpyridine) block copolymer film, acquired by sputtering with a 5 kV Ar2500+ gas cluster ion beam. High sensitivity imaging and spectroscopy for organic samples. Specific lipids in a brain specimen can be detected and imaged. 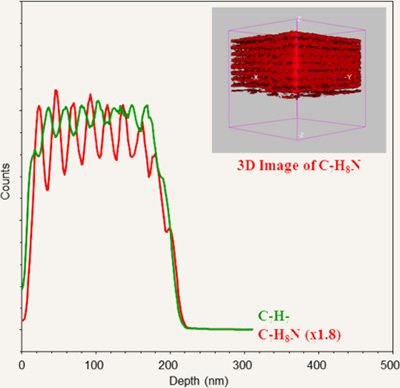 3D FIB-TOF tomography characterises and images complex matrix chemistries that would not be possible with traditional sputter depth profile analysis. Accurate 3D images are acquired, along with high quality mass spectra throughout the analysis volume. (See example at top of page). Application notes are available detailing a wide range of TOF-SIMS applications. Please contact us with details of your area of work for more information. TOF-SIMS secondary ion images of the surface of a heat-treated sample of PET.